Following the first round of voting, ArtPrize visitors have selected the twenty finalists—five entries from each category—that will move on with the chance of taking home the $200,000 Public Vote Grand Prize. GRAND RAPIDS, Michigan, October 4, 2015 – ArtPrize, the radically open international art competition decided by public vote and expert jury, today announced the twenty artist entries selected from among 1,550 eligible works during the first round of public voting—presented by Meijer—that will move on to Round 2 Voting with the hopes of winning the world’s largest art prize. 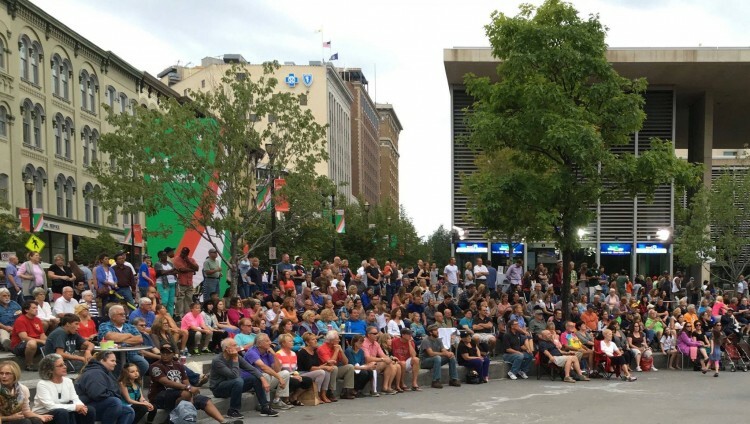 Hundreds of visitors filled Rosa Parks Circle in downtown Grand Rapids this afternoon as ArtPrize Founder, Rick DeVos, and Executive Director, Christian Gaines, revealed the public’s top picks. Round 1 Voting closed last night at 11:59 p.m., and 30,994 visitors had cast 377,302 votes for art, elevating five artist entries from each category—2-D, 3-D, Installation, and Time-Based. These twenty ArtPrize Seven entries will move on to the second round of voting, with the chance of winning over $200,000 in cash awards. “Every year the conversations surrounding the Public and Juried Shortlists evolve and grow and it’s incredibly inspiring to witness,” noted Kevin Buist, ArtPrize Exhibitions Director. “ArtPrize is a catalyst for debate and discussion and the dynamic between these differing opinions and selections is often where the most fruitful and intriguing conversations lie." The ArtPrize Seven Final 20 includes four prize-winning Artists from 2013, each of whom are displaying in the same venue as their 2013 entry. The top three winners from 2013 once again stand the chance of winning a cash prize at ArtPrize Seven—with each returning to the Gerald R. Ford Presidential Museum for this year’s competition. Ann Loveless, ArtPrize 2013 $200,000 Grand Prize winner for her quilt Sleeping Bear Dune Lakeshore, returns to ArtPrize Seven alongside husband Steven Loveless with a collaborative piece. Anni Crouter finished second in 2013—taking home the $75,000 prize for her hyper realistic painting, Polar Expressed. Andy Stacksteader took home the third place $50,000 prize in 2013 for his sculpture, Uplifting. Robin Protz, who also collected a $5,000 prize in 2013 for Myth-or-Logic, is once again a public vote favorite at Amway Grand Plaza Hotel. ArtPrize visitors will have one more opportunity to voice their opinions and decide the winners of over $200,000 in prizes. Round 2 Voting will commence at 2:00 p.m. EST today, October 4 and will run through October 8 at 11:59 p.m. EST. Visitors can cast up to twenty votes, one per finalist, and ArtPrize encourages visitors to consider voting for at least one entry in each category. The winners of both the public and juried awards totaling $500,000 will be announced at the Seventh Annual ArtPrize Awards on October 9.